The air bubbles possess a different refractive index than the surrounding medium (water). This makes the bubbles appear to have a thick dark border. The shape of the bubble focuses the light in such a way that the center of the bubble appears bright. Large sheet-like specimens (e.g. onion skin): These specimens may catch air bubbles underneath them and prevent them from escaping. Push out the air bubbles before adding a cover slip. Specimens with many fine hair: The hair catch much air and prevent the water from reaching all the parts of the specimen. The surface tension of the water is too high, and the water therefore does not “flow” into all parts of the specimen. This is comparable to the “Lotus Effect”, where the water does not wet the surface of the lotus leaf. Fatty and hydrophobic specimens: These too do not accept water well, especially if the surface area of the specimen is large (many fine hair, etc). It may help to treat the specimen in alcohol or an alcohol-water mixture to remove the fatty surface. 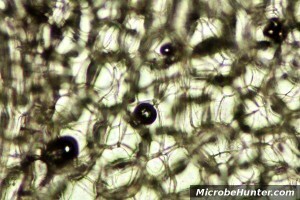 Porous specimens: The pores of the specimen may be filled with air, which can be difficult to remove. The cells of plant stems, the vascular tissue, for example, are able to hold air. It is possible to remove the air by placing the specimen into a vacuum while it is submerged in the fixing solution. Aspirators (eductor-jet pumps) can be mounted to a water tap to produce a vacuum. The bubbles cause optical artifacts at the place where the air meets the water. The air bubble appears to be surrounded by a dark ring. This dark ring covers some parts of the specimen and makes observation more difficult. The microscope optics are designed to give optimum resolution for a specimen which is surrounded by water. If the bubble is large and the specimen completely surrounded by air, then the resolution is lower. Are there cases when air bubbles are beneficial? Under some rare circumstances, air bubbles can even be beneficial. The bubbles can serve as a source of oxygen for some organisms, such as paramecia and other ciliates. It is possible to see them collect around the bubbles. Air bubbles are also easily viewable and can therefore help beginners to more easily find the correct focus. Naturally, the bubbles should not be confused with the actual specimen, something that beginners sometimes do because the bubbles are so prominent and can be seen even if the specimen itself is not in focus. Cover slip placement: Lower the cover slip on the water droplet with an angle. This permits air to escape on one side. Water placement: If the specimen is not fully submerged in the water droplet, add another droplet on top of the specimen before lowering the cover slip. Immersion oil: Use a medium other than water. Try immersion oil, which is hydrophobic. Some specimens prefer water, others oil. Break the surface tension: Add a small amount of detergent, such as soap. This will break the surface tension of the water. The water will therefore adhere better to some specimens, thus preventing bubbles. The soap may also harm some water organisms, however. Apply a vacuum: This speeds up the movement of the fixing solution or water into the specimen. Dehydrate the specimen: Place the specimen into alcohol. Some specimens will shrink and lose water and air. By placing the specimen into water again, the specimen will take up the water. Remove oil and fat: Wash the specimen in alcohol. Add water: If the air bubble is large and reaches the side of the cover glass, you can add more water from the side of the cover glass. Don’t use water straight from the tap! Mains tap water is held under pressure, so can be supersaturated with air and form bubbles on contact with your specimen. Freshly boiled but cooled water will be almost devoid of dissolved air so small bubbles in your prep might just dissolve. For living green plant material, minimise illuminating it before photography or it’ll photosynthesise and release CO2.